Rustic but not unrefined, David Jonathan Ross’s Turnip can be planted in any ground, and still come up hardy, tasty, and readable. With Turnip, David Jonathan Ross created a strong and original text typeface with an energetic tension between squarish inner and round outer shapes. 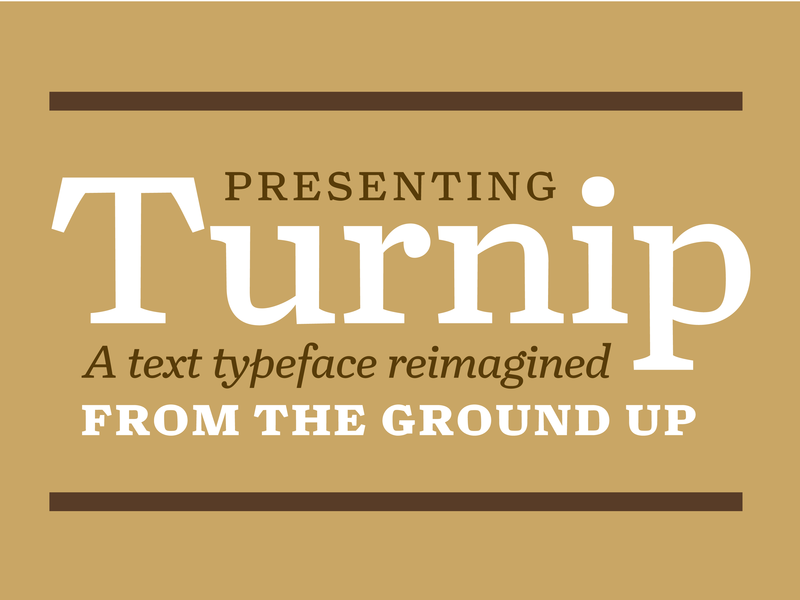 Turnip is rustic but not unrefined-an easygoing, charming, and readable face for body text. It is an “exploration in ruggedness,” as Ross states, inspired by a fondness for Bookman. Turnip comes in six weights from light to black, each with italics. The fonts are outfitted with extended language support and a host of OpenType layout features-including small caps, case-sensitive punctuation, multiple figure styles, arbitrary fractions, numeric & alphabetic superiors, and stylistic alternates, plus a collection of ornaments and borders. Turnip was also the first type family from Font Bureau to be developed and released simultaneously for both print and web use (through our partners at Webtype). What makes Turnip particularly versatile for websites is the inclusion of Turnip RE (Reading Edge) fonts specially adapted for small sizes onscreen. Read more about Turnip for web use on Webtype’s blog. Whether you’re looking for a rugged face for print or a robust design for web use-or want to coordinate both!-the Turnip family is ready for harvest. Dig in. Turnip in use in the September 2011 catalog for the Wood Type, Evolved exhibition at the Center for Book & Paper Arts at Columbia College Chicago.